Aspirin and other non-aspirin non-steroidal anti-inflammatory drugs (NSAIDs) can inhibit aromatase activity and thus could selectively lower incidence of hormone receptor positive tumors. We assessed whether the association of aspirin and other NSAIDs with postmenopausal breast cancer risk differs by estrogen and progesterone receptor (ER and PR) status of the tumor. A population-based cohort of 26,580 postmenopausal women was linked to a SEER Cancer Registry to identify incident breast cancers. Regular use of aspirin and other NSAIDs was reported on a self-administered questionnaire mailed in 1992. Cox proportional hazards models were used to estimate multivariate relative risks (RRs) and 95% confidence intervals (CIs) of breast cancer incidence overall and by ER and PR status, adjusting for multiple breast cancer risk factors. Through 2005, 1,581 incident breast cancer cases were observed. Compared to aspirin never users, women who regularly consumed aspirin had a lower risk of breast cancer (RR = 0.80; 95% CI: 0.71–0.90), and there was evidence for lower risk with increasing frequency of use (RR = 0.71 for aspirin use 6 or more times/week vs. never use; P trend = 0.00001). Inverse associations for regular aspirin use were observed for ER+ (RR = 0.77; 95% CI 0.67–0.89), ER− (RR = 0.78; 95% CI 0.56–1.08), PR+ (RR = 0.79; 95% CI 0.68–0.92), and PR− (RR = 0.73; 95% CI 0.56–0.95) breast cancers. In contrast, use of other NSAIDs was not associated with breast cancer incidence overall (RR = 0.95, 95% CI: 0.85–1.07), or by ER or PR status. 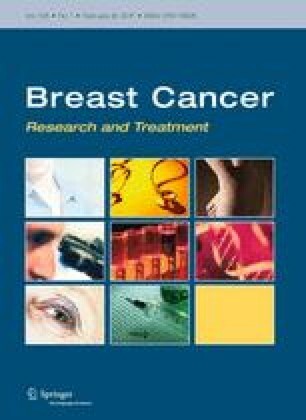 Aspirin, but not other NSAID use, was associated with about 20% lower risk of postmenopausal breast cancer and did not vary by ER or PR status of the tumor, suggesting that the hypothesized protective effects of aspirin may either be through cellular pathways independent of estrogen or progesterone signaling, or on tumor microenvironment. We would like to thank Dr. Vered Stearns, Associate Professor, Breast Cancer Program, Sidney Kimmel Comprehensive Cancer Center at Johns Hopkins, for her expert comments and feedback. We thank Sondra Buehler for editorial assistance. This study was supported in part by a grant (R01 CA39742), National Cancer Institute (NCI), USA.